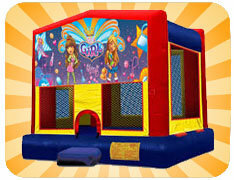 Our Girl Thing bounce house features birght and colorful graphics with your girlie girl in mind. This bounce house features a large bounce area that is 15 feet wide by 15 feet deep. This is a larger jumping surface than is found on our regular bounce houses. Park & Street Set up: Set up in a park requires permission from the park. A copy of the permit that shows approval of the bounce house needs to be provided at the time of reservation. Set up on a street requires a permit from the city and for the street to be completely shut down with city provided barricades. No cars can move within the set up area the length of time the bounce house is set up.